Thanks to Mdm Sam of Sew We Quilt and Debby of Debby Kratovil Quilts! and Connecting Threads as are sponsor. So, getting on with project, I bought some hexie templates with the idea of machine sewing them. It worked out pretty good for the most part I just need more time to finish. Not enough time in a day. and here is as far as I got. I used fabric from my stash. I started out thinking I was going to make a bed runner. My reasoning for that was I had comforter that stayed folded at the end of my bed for like.. 7 yrs. (it did come off to get washed, lol) No kidding, I made the bed with it maybe 5 times. I really didn’t like the comforter. So while purging and donating items, I just threw the comforter in the donate box. Then I thought “I just make a bed runner to lay on the bed”, but my husband wouldn’t like the girly colors. So I changed my mind and now here I am, a lap quilt. Thanks for taking the time to stop by. I really appreciate all the lovely comments and encouragement. You are really wonderful. Your comments are the best part of these hops. Here is today’s hop schedule and have a wonderful time hopping. Thanks for visiting me. I appreciate your kind words on my Rising Stars quilt. Love your shabby chic quilt! Lovely! Even if it is not finished it is great!! I love the colors!! Just keep plugging along. This is not a race and yes it sounds like you have a lot to do. I have to remind myself to just keep breathing sometimes too. Hang in there!! Very nice! Don’t worry about not completing it on time – life happens and occasionally takes precedence over sewing :(. Keep up the good work! I love the colors. It looks great so far. I love the fabric you have chosen. Your lap quilt is just beautiful! I think your hexie lap quilt is going to be beautiful. Thanks for sharing! Your are going to have a very special lap quilt. I am sure the lure of completing it will be strong once life slows down. Really like what you were able to accomplish on your abbreviated schedule. That will be a lovely small quilt/bed topper. The colors are so pretty and soft. With all the distractions that you have it is a wonder that the hexies got to this point! There are never enough hours in the day to all that we would like to do and I say that as a retired person! This is lovely no matter what it is going to be called in the end! Wonderful hexies. Will be a pretty quilt when done! Thanks for sharing. Love those cute little hexies!! What a pretty lap quilt! I’ll bet you enjoy it! Love the fabric you chose for your lap quilt!! You are a hexie princess, then. =) Every hotel I stayed on a recent trip had bed runners instead of entire bedspreads. It was a new concept to me! Your lap quilt is pretty. Some men are bothered by girly colors and others are not – we all have our individual preferences. You have had a busy summer, year and you were still able to get this much accomplished – WOW! Thanks for participating and the great inspiration. Loved the colors you used in the hexies. I’ll be watching to see it finished!! I love your soft color palette. It will be lovely when done. Take your time and enjoy the process. I certainly know how it is, trying to quilt something that the hubby will like as well as me! I think your lap quilt will turn out just beautiful! It looks so soft and cuddly. What you finished so far is beautiful. It’s going to be fantastic when finished. It’s looking great! I have a couple of projects that are long-term (my orange peel quilt is over 2 years, now!). I like them BECAUSE they are long-term. 🙂 No stress. No worry. Will finish when I finish. We all need some of that in our lives, eh? Your hexie lap quilt will be wonderful. I do like the colors. Thanks for sharing. Oh been there, done that, bought the t-shirt. I have been working so much, working in the yard, and canning that I have not set foot in my sewing room or even considered sewing for a week now. Hopefully things slow down for you soon too. I have the second ready to bind. Thank you for sharing. beautiful lap quilt to be. well done so far. Beautiful fabrics you’ve used, I’m sure that your quilt will turn out wonderful once you finish it. Thanks for sharing. Very pretty! And it’ll be gorgeous when done. Very Pretty. I love the pastel colors! Thanks for sharing. Great start with your hexies! Thanks for sharing with us! A wonderful start on your lap quilt. Very pretty. I love hexagons but they do take a long time to sew. Such pretty colors. Thanks for sharing how far you’ve gotten. Beautiful colors in your hexie quilt! Thank you for sharing. Don’t give up on you hexies. This will be lovely. Just breathe. Its beautiful and will look fabulous when finished – make sure you take care of yourself you sound very busy! Like what you have so far!!!! It will be a beautiful lap quilt when you finish. We all bite off more then we can chew at sometime and life has a way of interfering. Thanks for sharing. love what you have done it will be very pretty. I don’t seem to have enough time in a day either. 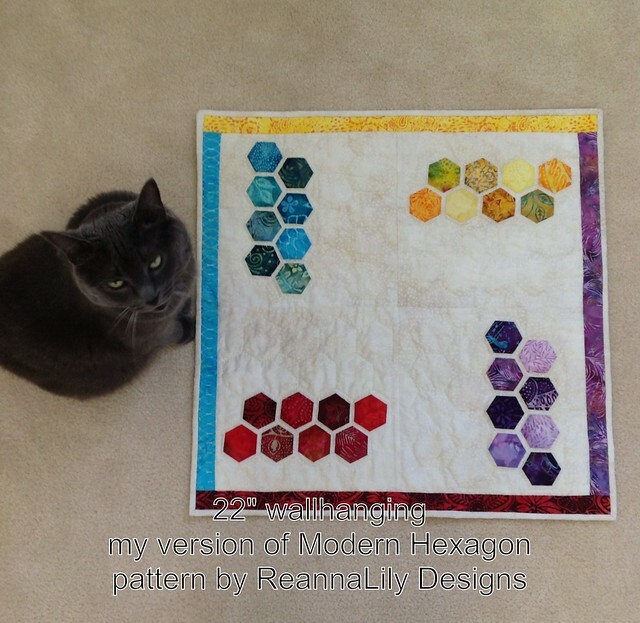 I love your hexies – they are so very pretty and will be a beautiful lap quilt! I am so glad that you shared them with us! Oh it’s beautiful! Do you use the Y seam method to machine stitch them? Thanks for participating and inspiring us today! Very pretty! Love your choice of fabrics! Thanks for sharing. I bet that we can all relate to time slipping away from us sometimes! I think you have a great start on your project and you will enjoy it so much more when you come back to it with the proper time to devote to it! Good luck! Best of luck finishing your lap quilt – it’s very pretty! Will you still make a hexie bed runner (in more masculine/less feminie colors?) It sure would be pretty as well! You did good! I love the softness of the colors. This is going to be so beautiful! I love the soft colors. I hope you have time to go back and finish it–sounds like you have too much on your plate right now. Good luck getting caught up! Love the start of your quilt. I know it will be charming when finished! You are very very busy, so down and smell the roses. The hexies relax me at night I love sewing them and looking at my leftover fabric. I love your scrappy hexies. I can’t wait to start making some myself. Thanks for the inspiration. What a beautiful quilt. Thanks for sharing. OK< now to your day, I love what you have done….it matters not you did not complete it….you got a lot done…and what is this..you are not going to be part of our hops ? oh my….we will miss you …. It will be a wonderful quilt. I love the colours in those soft tones. Have fun sewing them together. beautiful start; keep up the good work! Love your fabric choices, very eye pleasing. It’s going to be beautiful when finished. I love the fabrics. Your hexie lap quilt is going to be really pretty – thanks for sharing. What you have so far is really beautiful! It’s like a watercolor quilt without all the defined lines of typical hexie quilts. I think you’re far enough along to finish soon, otherwise the end of your bed will remain naked! Kudos to you for machine sewing those! Thanks for sharing what you have because it’s lovely! All that work – it needs to stay and occassionally add a row or two – they are a labor of love quilt. It will be a very lovely hexie quilt when it is fun. I am looking forward to see it finished. That is no small task! I think it looks lovely so far and you have already done loads! Amazing. As for your husband…. just add a row of brown hexies and tell him it is a fusion quilt! Great work. You have a great start! It will be lovely when you are done. What a beautiful hexie quilt in the making! It’s looking gorgeous, Theresa. We like what you have done – pretty colours. You sound very busy!